Aguado/Burts Understanding Weather and Climate illustrates meteorology and climatology using everyday occurrences and inspired technology tutorials to engage students in learning about atmospheric processes and patterns. The Seventh Edition extends coverage of global climate change with new and unique sections covering oceans and climate in the Earth system. 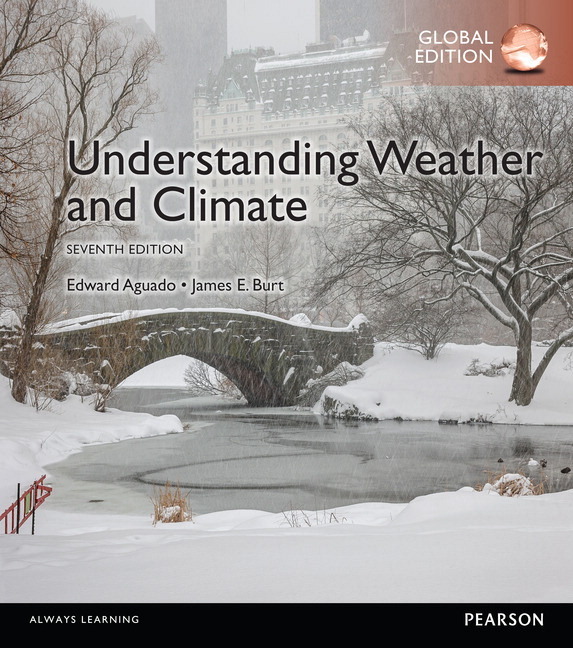 Each chapter also focuses on the human aspect of weather and climate, covering high interest weather-related hazards that draw students into the course, while incorporating the latest science and the most relevant issues. Students use their mobile devices to scan Quick Response (QR) codes in the book to view videos, for just-in-time visualization of key meteorological concepts and applications. Case Studiescover weather hazards and how they impact people and society. New and unique coverage on Oceans and their role in regulating weather and climate has been added in chapters 8, 15, and 16. Greater focus on the scientific method and basic concepts to help guide students. MasteringMeteorology is not included. Students, if MasteringMeteorology is a recommended/mandatory component of the course, please ask your instructor for the correct ISBN. MasteringMeteorology should only be purchased when required by an instructor. Instructors, contact your Pearson representative for more information. MasteringMeteorology with eText for Understanding Weather and Climate is an online homework, tutorial, and assessment product designed to personalize learning and improve results. With a wide range of interactive, engaging, and assignable activities, students are encouraged to actively learn and retain tough course concepts. NEW! The Seventh Edition is supported by Dire Predictions: Understanding Global Warming 2nd edition–an illustrated guide to the IPCC’s 5th Assessment Report. A pull-out Cloud Chart in the back of the book offers students a quick reference to cloud types and their significance. World meteorology reference maps are presented on the inside front and back. MasteringMeteorology is not included. Students, if MySocLab is a recommended/mandatory component of the course, please ask your instructor for the correct ISBN. MySocLab should only be purchased when required by an instructor. Instructors, contact your Pearson representative for more information.